Nestled in a 19th century townhouse on a tree-lined block in Carnegie Hill, Monograms off Madison is the perfect place for picking up a personalized gift for every occasion! The store, which opened in September 2010, pairs made-to-order gifts with excellent customer service for a one-of-a-kind shopping experience. Together with her husband, Christoph Angelbeck, Tierney has handpicked the store’s products from around the world with a focus on American-made goods. 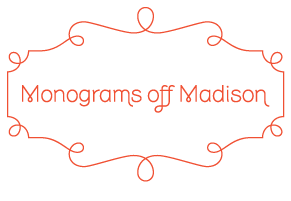 As a result, Monograms off Madison has an assortment of unique gifts such as monogrammed linens, personalized china, etched glassware, travel bags, stationery, bath towels, baby gifts, and much more! Similar to the personalized items in the store, Tierney and her staff make the entire experience a special one and assist customers from start to finish. From choosing the perfect item, deciding on the monogram style (over 50 to choose from), thread color (100+ available) and placement, Tierney’s expertise ensures each customer can create a truly unique gift.